Welcome friends, can I speak a little about something that has been bothering me? Thank you. Lately, I feel like I haven’t been doing justice to this little space I love so much. I haven’t been tending the seedling that is my Thoroughly Nourished Life address with as much care and discretion as I possibly could. When I first began writing here I promised wholefood vegetarian recipes, sweet treats (with a focus on gluten-free), active living, and fuel for the mind. I feel that I have wandered a little off course, and I want to right the ship a little. I have piles of cookbooks that I have bought and never cooked from, cooking and bake ware that still have the price tags attached, and notebooks full of ideas, but something keeps holding me back. No longer. This is my renewed commitment to Thoroughly Nourished Life. To whole foods, fitness adventures, books, articles, and ice cream (I bought an ice cream maker recently – and it is pink!) – here is to sharing it all with you. I want this space to grow from this tender beginning into something more. I want to reach out to others in the vast void in which our digital lives take place and make a real connection. I want Thoroughly Nourished Life to mean something to people, and give something back to all who grace me with their presence here. I want the words I write and recipes I share to contribute to the bounty available to us all here on the world wide web. In the realm of food blogs I stand in the shadow of giants, and they in the shadows of titans. Rather than being intimidated by their power and influence I am inspired to find my own little niche. I want to contribute my unique Australian-vegetarian-gluten-free-baker-runner-over-thinking voice to the chorus of glorious blogging voices that sing through the windy online halls. I want to bring joy to your tables; highlight the extraordinary in the everyday; start a conversation about how we nourish ourselves mind, body, and soul in this crazy modern world; share adventures and yummy sweets; and above all be authentic. So, today, I renew my promise, I refocus my aims for this little corner of the online world, and commit to living a Thoroughly Nourished Life online and off. Last night while all of these thoughts circled in my head I needed something grounding in my belly. I bought a bag of millet on the weekend and, once cooked with care in some vegetable broth, this gluten free grain was a creamy and comforting accompaniment to vegetables sautéed in some of my favourite spices. When I was cooking my millet I found these instructions from The Kitchn very helpful to read before I started. I enjoyed this meal by itself, but I can’t wait to try it with a poached egg balanced on top and sprinkled with a little extra sumac. Combine uncooked millet and vegetable stock in a small saucepan. Place over a medium heat with the lid on the pot, and simmer until millet is tender (about 25 minutes). 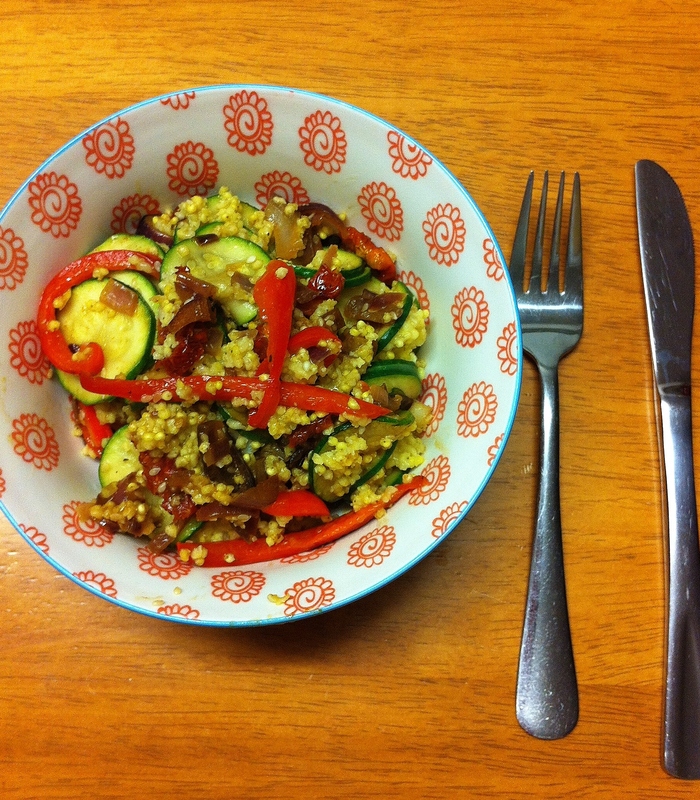 While the millet is cooking dice purple onion and sundried tomatoes, and thinly slice zucchini and red capsicum. Heat a small frying pan over medium heat and spray with olive oil. Add chopped vegetables, spices, salt and pepper. Sauté, stirring frequently, until onion is soft and translucent. Sprinkle over sesame seeds and stir gently. Cook for another minute or two. Once the millet is cooked (all the liquid should be absorbed by this stage) add to sautéed vegetables and stir to combine. Spoon into two bowls and enjoy. Thank you my friends for letting me get this off my chest. There may be some changes here as I figure out how to live up to my goals for Thoroughly Nourished Life, and please let me know if there is anything you would like to see more of. oh my gosh, the TIMING of this post is so funny, because i’ve been struggling with plenty of my own blogger guilt! but i will give u far more credit than i, my blog was so dusty it crew cobwebs. but dedicating ourselves to things that make us happy, and nourish the spirit, and make us excited are worth chasing. i’ve got a project i’m working on and it sounds like ur taking this blog as ur project under the wing and revamping it with renewed enthusiasm!! can’t wait to see it all…but i will say, never once have u strayed from writing words that evoke emotions and feelings from ur readers. mmmmk. I’ve never cooked with millet, it looks very rustic and I love the colours in your dish. Also a poached egg pretty much goes with anything I’ve found so give it a try! Thank you Emma. I love writing here, I just feel like I’ve lost my theme/voice/mojo a little. Millet is really easy to cook (absorption method) and a great alternative to rice or quinoa too. Very well said, Amy. And this dish looks divine! I needed it last night. Instead I ate almost the whole tray of enchiladas. BAD idea. Awww I think you completely nail it already. I love your mix of recipes and words. I love that your blog celebrates foods and is constantly about the joy of food. In a world where everyone is obsessing over everything they put in their mouth, trying to avoid this or cut out this or not eat more than this it is so refreshing to constantly be reminded that food is also to be enjoyed and is nourishing.